Here’s the truth about James Bond movies… well, my truth anyway. James Bond movies are like white sliced loaves of bread – you have to catch them first while they are very fresh. The key word in that statement is ‘first’. If you get a nice fresh loaf of bread and it slowly goes a bit stale on you, you can still use it. You can perhaps toast it or grate it up for breadcrumbs or… well, you get the idea. If it was somebody else’s loaf of bread, you wouldn’t dream of using it. You would just throw it out. But this is your loaf, you knew it when it was fresh and tasty, it has aged and hardened under your watchful eye and so you still hold some deep-seated affection for it. Let’s face it, most of the James Bond movies are very much like loaves of bread. They are conceived and executed to be at their best on the day that they are released. They use ingredients which date and age and lose their quality quite quickly. They become hard to swallow. The early ones are the exception to this little rule of mine. Whether that’s because they weren’t trying so hard to be ‘of-the-moment’ or whether it’s because they come from a time when many of the fans weren't actually born – thus allowing a greater deal of respect - well I’m not sure. It’s probably just because that young Connery was so damn good that all other considerations pale. Whatever the reason, those first three do buck the trend and they remain eminently watchable. 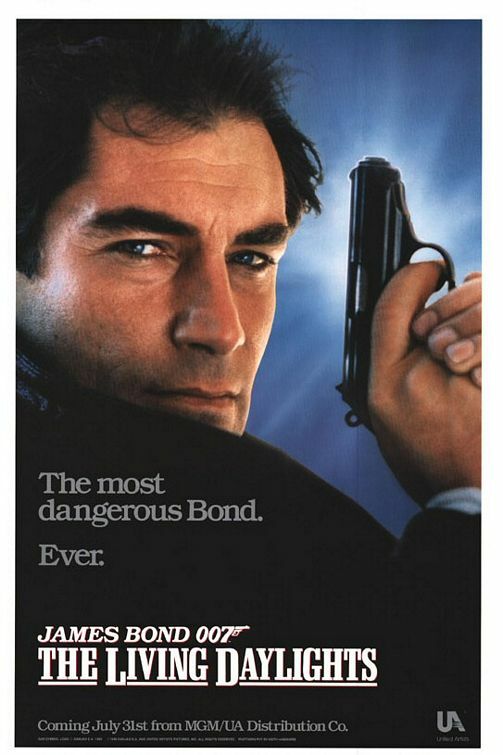 So, having said all that, let me present my defence of Timothy Dalton as James Bond. Many of you will disagree. That’s understandable. Dalton, you see, was my ‘Loaf of Bread’. It’s quite possible that he wasn’t yours. For me, Dalton’s first Bond film, The Living Daylights, arrived like a super-refreshing bolt-from-the-blue. Roger Moore had ceased to have any relevance, to anything, several features before he finally bowed out and, as a result, the franchise was two stages past being on its knees. Casting Dalton was a brave and imaginative move and he threw out most of what had gone before and made the part his own. The music was brilliant, the film looked fabulous on the big screen. It was, at times, romantic and sweet in a way that no other Bond film was ever brave enough to try and it had a re-worked hard edge to it that the Moore Era had successfully worn away over such a long time. Plus Maryam d'Abo was a lovely Bond girl. But, just because I like my own loaf of bread, that doesn’t mean that I can’t see that it has gotten stale over time. It is a fact that Bond movies go stale and, when they do, our affection for them comes down to our memories of how we were when we first saw them – it is this which keeps a particular one high in our esteem and allows us to remember how good it once used to be. When I see it now, I see the staleness. I see the rather insipid villains, the unconvincing Mujahideen sequence, the milkman with his exploding bottles… I see how it probably won’t convince anyone who sees it for the first time now. I also see the value in other people’s loaves of bread, even if they are not mine. For me, Craig’s Casino Royale remains a stunning and almost flawless reboot and I will not argue with anyone who puts him second best. I will, perhaps, quietly point out that his second outing ‘Quantum of Solace’ is almost grindingly boring from start to finish (I watched it twice to confirm this) but I will also accept that Dalton’s second attempt ‘Licence to Kill’ was also quite poor. …your own personal ‘Loaf of Bread’. I just bet it was. Dalton wasn't just my "loaf of bread", he was, and still is, my definitive Bond. I'd seen Connery/Moore adventures, but this was the first Bond who actually seemed real to me. His style, mannerisms, looks, flaws, were all so much closer to the Bond of the books than ever before. This was a Bond who was seriously dangerous, with a sly wit, but wasn't comical. He had style, but he also had brutality. And this was the first and only Bond (to me) that you could see actually felt screwed over when things didn't go to plan. I'm not a fan Craig at all. He just doesn't fit the role of Bond for me, and I cant wait to see someone else take the role. Craig plays a ruffian thug, whereas Bond needs to be a stylish, controlled thug. It is a vast difference that to me, only Dalton came close to capturing on screen. My little rant, anyway. Thanks for sharing, Ken! Hi Andy - Very well put, sir, thanks for taking the time to say it. he may be too old to continue.I think the writers can be blamed for quantums'lack of success they've been round for quite a while and maybe fresh blood would help fancy a job? Hi Ken! My first Bond was Connery, but Dalton remains my favorite. I loved Roger Moore as the Saint and Brosnan was terrific as Remington Steele, but Dalton was a fresh face. I was impressed with his keeping alive Bond's ladykiller aspects during the height of political correctness. I could go on, but I won't. You're right Ken, one of the reasons Bond does work is because it is of the time it was made. It also allows the strengths of the actors to come through, albeit within certain signifiers that remain the same (cars, gadgets, girls). Connery - as well as being fantastic - represented the supposedly classless, optimistic 60s. As a former Mr Universe entrant, he was also a huge physical presence - indeed, one of the things that got him the role was the way he moved. I wonder if one of the reasons his films are so beloved is because of the nostalgia for that era? Moore's Bond came from a strike-torn 70s - no social fluidity here - and he was also a much more light actor than Connery, and less of a physical presence. That led to greater comedy and quips from him and in the films in general, as well as the emphasis on 'keeping the British end up'. He should have quit three films before he did though. Dalton was an excellent choice, and should be applauded for moving Bond towards his tougher, edgier roots. But I think the films struggled because in the late 80s, alot of the traditional Bond signifiers had lost their cache - like sleeping around and smoking. On top of that, people were used to a lighter touch in Bond films, and so expected some comedic elements which were not Dalton's strength. Although his films weren't consistently good (Goldeneye excepted) I feel Pierce Brosnan was a great Bond and had a lot of the elements the character requires. As for Daniel Craig, if anything his Bond reflects the fact that the Bourne films had performed so well as opposed to any social trends of the last few years. When Bond returns, it will be interesting to see if Craig is in the role or if they try and make something new again. And in case you're wondering, I did my Uni dissertation of this exact subject. I’ve never been a great Bond fan in fact it’s years since I watched one, not since Moore’s day and I don’t think I’ve seen all of his. The last one I saw in the pictures was when I was on my first honeymoon and it was the only thing playing. I actually enjoyed Lazenby’s outing. Not sure why he wasn’t popular. I think he was simply the Brandon Routh of his day. Bond films are on TV all the time and so there’s no reason not to catch up on some of the ones I’ve missed other than the fact I prefer my spies more George Smiley than Derek Flint. I have probably seen all of Connery's though. After Sean Connery all the James Bond's look like male models and seem pretty, polished and perfect. I haven't seen Craig as Bond. I wait for them to come to TV these days. But he does have more of the look of a guy who has taken a few knocks and gone without washing his hair a day or two and maybe he suit gets dirty (and stays that way) once in a while.